A crusher is a multi dimensional machine which is designed to reduce large size materials into smaller size materials. Crushers may be used to reduce the size, or change the form of waste materials so they can be more easily disposed of or recycled, or to reduce the size of a solid mix of raw materials (as in the case of ore), so that pieces of different composition can be differentiated for separation. Crushers are normally low speed machines that are designed for breaking large lumps of ores and stones, even aving a size with a diameter of over one and half meter. The purpose of crusher is to reduce the size of the materials for making them usable in construction or industrial use, or for extraction of valuable minerals trapped within a ore matrix. Crushing is the process of transferring a force amplified by mechanical advantage through a material made of molecules that bond together more strongly, and resist deformation more, than those in the material being crushed do. Crushing devices hold material between two parallel or tangent solid surfaces, and apply sufficient force to bring the surfaces together to generate enough energy within the material being crushed so that its molecules separate from (fracturing), or change alignment in relation to (deformation), each other. There are four basic ways to reduce a material, namely (i) impact, (ii) attrition, (iii) shear, and (iv) compression. Most crushers employ a combination of all these crushing methods. Impact – In crushing terminology, impact refers to the sharp, instantaneous collision of one moving object against another. Both objects may be moving, or one object may be motionless. There are two variations of impact, namely (i) gravity impact, and (ii) dynamic impact. Material dropped onto a hard surface such as a steel plate is an example of gravity impact. Gravity impact is most often used when it is necessary to separate two materials which have relatively different friability. The more friable material is broken, while the less friable material remains unbroken. Separation can then be done by screening. Material dropping in front of a moving hammer (both objects in motion), illustrates dynamic impact. When crushed by gravity impact, the free-falling material is momentarily stopped by the stationary object. But when crushed by dynamic impact, the material is unsupported and the force of impact accelerates movement of the reduced particles toward breaker blocks and/or other hammers. Dynamic impact has definite advantages for the reduction of many materials. Attrition – It is a term applied to the reduction of materials by scrubbing it between two hard surfaces. Hammer mills operate with close clearances between the hammers and the screen bars and materials reduce by attrition combined with shear and impact reduction. Though attrition consumes more power and exacts heavier wear on hammers and screen bars, it is practical method for crushing the less abrasive materials such as limestone and coal. Shear – It consists of a trimming or cleaving action rather than the rubbing action associated with attrition. Shear is usually combined with other methods. For example, single roll crushers employ shear together with impact and compression. Shear crushing is normally called for under the conditions when material is somewhat friable or when a relatively coarse product is desired. It is usually employed for primary crushing with a reduction ratio of 6 to 1. Compression – As the name implies, crushing by compression is done between two surfaces, with the work being done by one or both surfaces. Jaw crushers using this method of compression are suitable for reducing extremely hard and abrasive materials. However, some jaw crushers employ attrition as well as compression and are not as suitable for abrasive materials since the rubbing action accentuates the wear on crushing surfaces. As a mechanical reduction method, compression is to be used if the material is hard and tough, if the material is abrasive, if the material is not sticky, and where the finished product is to be relatively coarse. 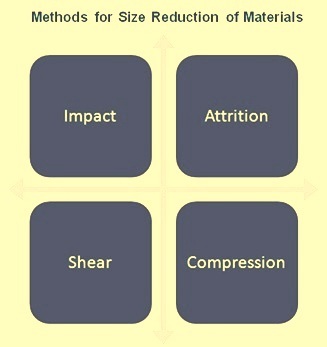 The above four methods for the size reduction of materials are shown in Fig 1. The reduction of size of the material when it pass through a crusher is expressed as reduction ratio. The reduction ratio is the ratio of the crusher feed size to product size. The sizes are usually defined as the 80 % passing size of the cumulative size distribution. Crushers are classified into three types based upon the stage of crushing they accomplish. These are (i) primary crusher, (ii) secondary crusher, and (iii) tertiary crusher. The primary crusher receives material directly from run of mine (ROM) after blasting and produces the first reduction in size. The output of the primary crusher is fed to a secondary crusher, which further reduces the size of the material. Similarly the output of secondary crusher is fed to the tertiary crusher which reduces the material size further. Some of the materials may pass through four or more of the crushing stages before it is reduced to the desired size. The degree of crushing is spread over several stages as a means of closely controlling product size and limiting waste material. Crushers are also classified by their method of mechanically transmitted fracturing energy to the material. Jaw, gyratory and roll crushers work by applying compressive forces while impact crushers such as hammer crusher apply high speed impact force to accomplish fracturing. There are several types of crushers which are used in various industries. These are given below. One jaw is kept stationary and is called a fixed jaw while the other jaw, called a swing jaw, moves back and forth relative to it, by a cam or pitman mechanism. The volume or cavity between the two jaws is called the crushing chamber. The movement of the swing jaw can be quite small, since complete crushing is not performed in one stroke. The inertia required to crush the material is provided by a weighted flywheel that moves a shaft creating an eccentric motion that causes the closing of the gap. Feed is entering to crusher from the top and lumps are crushed between jaws. Jaw crushers are heavy duty machines and hence need to be robustly constructed. The outer frame is generally made of cast iron or steel. The jaws themselves are usually constructed from cast steel. They are fitted with replaceable liners which are made of manganese steel, or Ni-hard (a Ni-Cr alloyed cast iron).Usually both jaws are covered with replaceable liners. Also in some types, the liners can be turned upside down after a while, extending the replacement time. A gyratory crusher is similar in basic concept to a jaw crusher, consisting of a concave surface and a conical head with both the surfaces are typically lined with manganese steel liners. The inner cone has a slight circular movement, but it does not rotate. The movement is generated by an eccentric arrangement. The crushing action is caused by the closing of the gap between the mantle line (movable) mounted on the central vertical spindle and the concave liners (fixed) mounted on the main frame of the crusher. The gap is opened and closed by an eccentric on the bottom of the spindle that causes the central vertical spindle to gyrate. The vertical spindle is free to rotate around its own axis. The material travels downward between the two surfaces being progressively crushed until it is small enough to fall out through the gap between the two surfaces. A gyratory crusher is used both for primary or secondary crushing. Cone crusher is consisting of a crushing chamber, a crushing cone and a operating mechanism. The cone is built in to a vertical shaft, which is supported from the top with a bowl-shaped bearing and from the other end to an eccentric operating mechanism. Cone crusher is similar in operation to a gyratory crusher, with less steepness in the crushing chamber and more of a parallel zone between crushing zones. A cone crusher breaks material by squeezing the material between an eccentrically gyrating spindle, which is covered by a wear resistant mantle, and the enclosing concave hopper, covered by a manganese concave or a bowl liner. As the material enters the top of the cone crusher, it becomes wedged and squeezed between the mantle and the bowl liner or concave. Large pieces of the material are broken once, and then fall to a lower position (because they are now smaller) where they are broken again. This process continues until the pieces are small enough to fall through the narrow opening at the bottom of the crusher. A cone crusher is suitable for crushing a variety of mid-hard and above mid-hard materials. Feed is dropped to the crusher from the top and it is crushed between the crushing chamber and the slowly rotating cone. Cone crushers are mostly used for the large scale crushing in the mining industry. It has the advantage of reliable construction, high productivity, easy adjustment and lower operational costs. The spring release system of a cone crusher acts as an overload protection that allows tramp to pass through the crushing chamber without damage to the crusher. Roller crusher is a crusher that breaks material by squeezing it between two revolving metal cylinders, with axes parallel to each other and separated by a space equal to the desired maximum size of the finished product. It consists essentially of two opposite directions driven cylinders that are mounted on horizontal shafts. The other shaft is mounted permanently in the frame and is leaning on robust springs. The gap between cylinders can be adjusted, so the size of crushed product is easily adjustable. Usually both cylinders are covered with manganese steel liners. Crushing ratio is usually lower than in other crushers. Roll crusher is suitable for fine crushing. The roll crusher uses compression to crush materials. Reduction ratio is 2 to 2.5 to 1. Roller crushers are not recommended for abrasive materials. Hammer crusher consists of a high-speed, usually horizontally shaft rotor turning inside a cylindrical casing. The crusher contains a certain amount of hammers that are pinned to the rotor disk and the hammers are swinging to the edges because of centrifugal force. Feed is dropped to the crusher from the top of the casing and it is crushed between the casing and the hammers. After crushing the material falls through from the opening in the bottom. Impact crushers are often used with materials, which are soft or which are easily cleaving from the surface. The crusher consists of a fast spinning rotor and beaters attached to the rotor. Feed is entering to the crusher from the top and crushing starts immediately when the feed is impacted with beaters towards the crusher’s inner surface. Impact crusher can also be equipped with a bottom screen, which prevents material leaving the crusher until it is fine enough to pass through the screen. This type of crusher is usually used for soft and non abrasive materials. The basic concept of the mineral sizer is the use of two rotors with large teeth, on small diameter shafts, driven at a low speed by a direct high torque drive system. This design produces three major principles which all interact when breaking materials using sizer technology. The unique principles are the three-stage breaking action, the rotating screen effect, and the deep scroll tooth pattern. The three-stage breaking action – Initially, the material is gripped by the leading faces of opposed rotor teeth. These subject the material to multiple point loading, inducing stress into the material to exploit any natural weaknesses. At the second stage, material is broken in tension by being subjected to a three point loading, applied between the front tooth faces on one rotor, and rear tooth faces on the other rotor. Any lumps of material that still remain oversize, are broken as the rotors chop through the fixed teeth of the breaker bar, thereby achieving a three dimensional controlled product size. The rotating screen effect – The interlaced toothed rotor design allows free flowing undersize material to pass through the continuously changing gaps generated by the relatively slow moving shafts. The deep scroll tooth pattern – The deep scroll conveys the larger material to one end of the machine and helps to spread the feed across the full length of the rotors. This feature can also be used to reject oversize material from the machine. The following are the criteria used in the selection of the right type of a crusher for crushing a material. Production requirement – It includes output size and shape, and the required capacity. Ore characteristics – Include material specification, feed (input) size, material friability, and material abrasiveness. Operational considerations – It includes power demand, equipment availability (hours/annum), availability and cost of replaceable parts, reduction ratio, maintenance requirements, needed manpower, approachability of parts for maintenance, availability of spares, safety and environment. Equipment ruggedness – Can the crusher pass uncrushable debris without damage to the crusher.